We fix slow Internet connections! With the first router that adapts to your line. IQrouter is an intelligent, secure router that knows how to use whatever Internet speed you have and actually make it work. The problem is not the speed of your Internet. It's congestion caused by your router. The routers provided by your ISP are pathetic. Replacement routers are barely better. 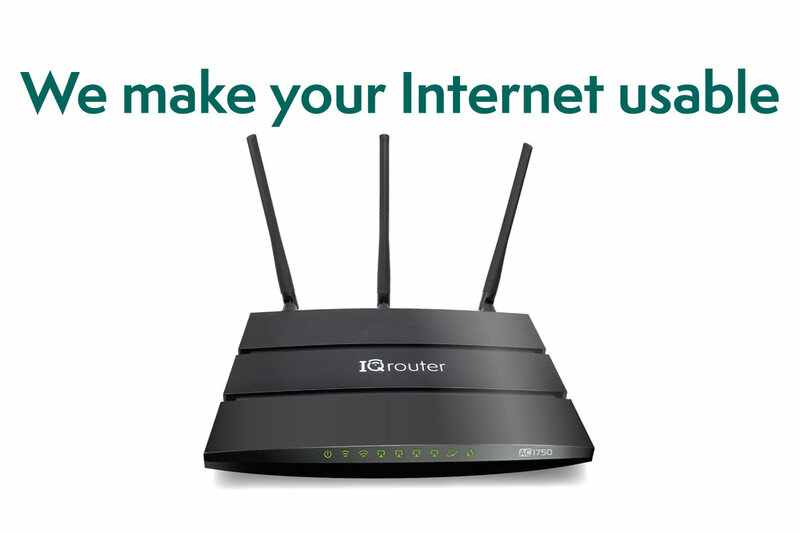 IQrouter is the only self-optimizing router on the market. That means that from the moment you install it you get optimum Internet Quality. It doesn't stop there. It continues to optimize over time, since no line is ever steady. For example, in the evenings your line is probably slower because everyone out there is streaming videos. IQrouter dynamically optimizes for that lower speed allowing you to stream your own videos with no hiccups. IQrouter is an absolute must if you work from home! You can reliably have video conference calls, lead webinars, upload/download huge files, and do all your transactions with no glitches or dropped connections. If you are on DSL technology for your Internet, then you absolutely need an IQrouter, as it will make this limited connection actually usable. Regardless of technology, if you have limited upload bandwidth, the IQrouter is the only router to deliver high quality right out of the box. Even fast VDSL and cable lines benefit greatly from the IQrouter's smart traffic management.